From a single downtown storefront to a national multi-unit chain, Pane Bros. specializes in performing commercial window washing services that can take care of all your business’s needs. Finding a reliable, affordable window washer should be one of the easier tasks associated with handling the cleaning and maintenance of your business. All too often we are introduced to customers and they tell us stories that contradict that very belief. Either people didn’t return their call or they never showed up as promised or they’d only service certain neighborhoods and so on. 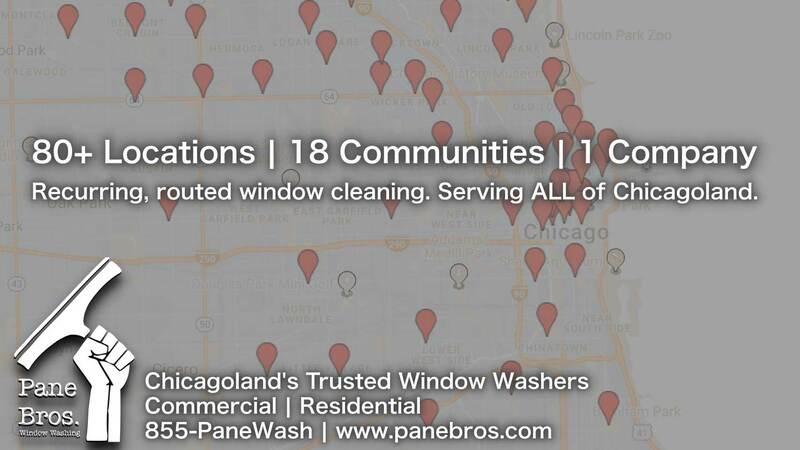 At Pane Bros., we make every effort to be responsive, keep to the requested frequency and provide service to all of Chicagoland and NW Indiana (some parts of Southern Wisconsin too). And whether you want on-demand service or a recurring, scheduled window cleaning program, we are prepared to work with you to get you exactly what you want. Our crews already care for retail stores, restaurants, shopping centers, office buildings and homeowners all over Chicago and its suburbs, so we are ready to work with you no matter where you are located. For our commercial clients, we are also familiar with ServiceChannel, Corrigo, Big Sky and other 3rd party work order software programs. From commercial storefronts and office buildings to HOA’s and single-family residences, Pane Bros. Window Washing is ready to work with you and earn your business each and every time. The trusted and caring team at Pane Bros. Window Washing is ready to show you what it’s like to have an affordable (and happy!) window washer take care of your dirty windows.